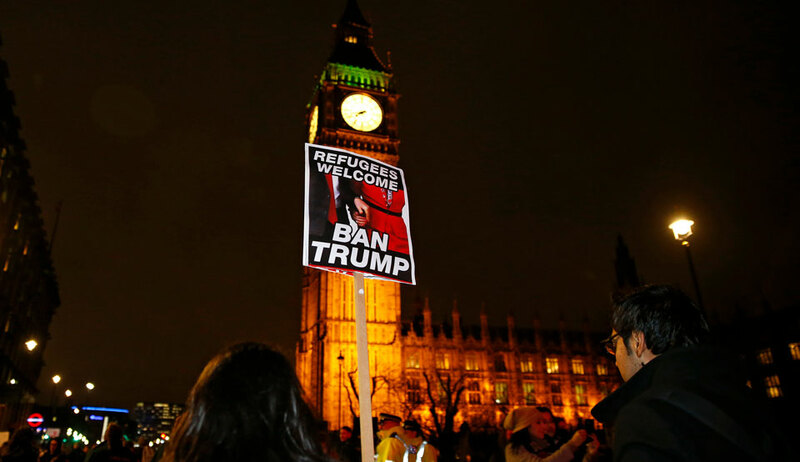 LONDON—Anti-Trump campaigners in Britain claimed victory today after the U.S. president cancelled a planned visit to London. Mayor of London Sadiq Khan said that the billionaire bigot’s arrival would have been met with “mass peaceful protests” against his divisive policies. Donald Trump was due to cut the ribbon of the new U.S. embassy in south London next month. He claimed that he cancelled the trip because he was unhappy at plans to move the embassy from Grosvenor Square in swanky Mayfair to the newly developed Nine Elms area, south of the Thames River. He angrily attacked his predecessor Barack Obama for selling off the building “for peanuts” and spending $1.2 billion on a new one. However, the move to Nine Elms was first announced in 2008, when George W. Bush was still president. Maz Saleem of campaign group Stand Up to Trump welcomed the news, saying: “It is a victory for the millions who oppose the president’s racism, his addiction to war, his sexism, and his billionaire’s contempt for ordinary people. Mayor Khan, who hails from the Labour Party, argued that the real reason the U.S. president had pulled out of the planned visit was that he had “got the message” that Londoners oppose his bigoted policies and actions. “This just reinforces what a mistake it was for Theresa May to rush and extend an invitation of a state visit in the first place,” he added. Meanwhile, Trump was roundly criticized for his racist slurs against Haiti and “shithole countries” in Africa. Felicity Collier is a reporter for Morning Star, the socialist daily published in the U.K.